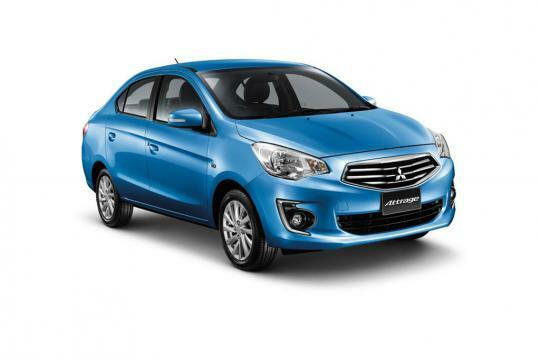 Mitsubishi Motors has revealed the first official photo and initial details of the brand new Attrage compact sedan. The car is the production version of the G4 concept which was displayed at the 2013 Bangkok Motor Show. Mitsubishi said the name 'Attrage' is derived from the word 'attractive'. Mitsubishi claims that the Attrage will deliver 'driving pleasure thanks to agility and pleasing driving dynamics'. Powering the Attrage is a 1.2-litre 3A92 three-cylinder MIVEC unit which churns out 76bhp at 6,000rpm and 100Nm at 4,000rpm. The engine is mated to a choice of CVT or five-speed manual transmission as standard. Based on the Mirage hatchback, the compact sedan measures only 4,095mm, which is about 300mm shorter than its close rival, the Toyota Vios. There are no interior photos of the new sedan at the moment but Mitsubishi says that the car offers generous rear seat legroom. The new model will be launched in Thailand come July 2013. It is trying to copy Kia design from the recent K3 and K9 but failed miserably. Damn, this is one ugly-looking piece of metal from the Japs again!